How are You Going to Share Your Magnificence in the World? You are perfect exactly as you are! 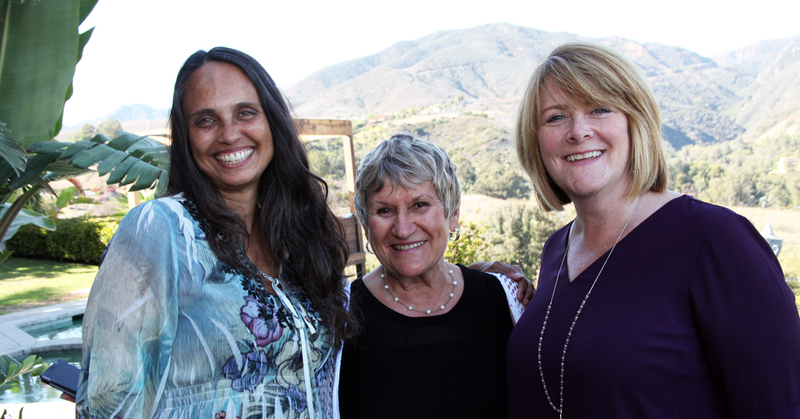 I had the blessing and pleasure of teaching with two amazing women this weekend — Barb Patterson and Elsie Spittle. Barb Patterson and I often teach together on our Mastermind for Solopreneurs, and we will be doing the experiment of The Engaged Space together starting next week, but this is the first time we are teaching together in person. Elsie Spittle is one of the first teachers of the Three Principles, and she knew Sydney Banks, the man who uncovered the principles, before he had his enlightenment experience. It is such an honor to be in this conversation with her. As I reflect on our first day, what stands out for me is the simplicity of the teaching. We are the infinite potential of Mind. We have the capacity to see that we are both form and formless, and we have the capacity to create via the principle of thought. Even if we are not aware of this, this is happening. You do not have to consciously know or understand how the principles work in order to benefit from the wisdom of them. They point to the formless essence of love that is who we all are. We are all waking up to this whether we know it or not. We all experience our spiritual nature. We can’t ever understand it intellectually, but that doesn’t matter because it still moves through us and transforms us. To know that I do not need to work on my awakening takes so much off of my To Do list. Previously I thought I needed to improve myself in order to be worthy of awakening more fully to my true nature. How blind I was to the impossibility of this. My spiritual nature just is. I do not need to earn it, just like I do not need to be worthy of the nose on my face, or the fact I am a human being. I just am. This frees me up to be myself, and to have far more energy to simply enjoy life and be of service. I used to innocently waste so much energy worry about myself, evaluating how I was doing, and trying to change what I saw as my limitations. My freedom from self-absorption comes from recognizing I am perfect exactly as I am. Not from an egotistical point of view, but from the quiet knowing of I am enough. The solid foundation of understanding I am okay as I am. Can you feel that foundation inside of you? Can you hear your wisdom reassuring you of your perfection exactly as you are? Rather than needing to work on ourselves and practice self-improvement, we can, instead, look at the perfection of who we are and see what is already working in our lives. We can look for when our wisdom is showing up rather than seeking out its absence. Where we choose to look is important. Are we going to look out for our spiritual nature unfolding through us, or are we going to judge our humanness as inadequate? It is the same picture, just different ways of seeing. I encourage you to recognize your magnificence in this moment. Not from your ego saying you are better than, but from your ability to see the miracle of you. Which is the miracle of us — the miracle of the oneness to which we all belong. This is the simplicity of experiencing the fullness of who we are – our humanness and our spiritual nature. We are each one of us a miracle, and we have the ability to wake up to that more fully, and to experience the energy of that realization. We are all love. We have the capacity to bring the essence of our formless nature and express that into form. We have the infinite capacity to create. What do you choose? If you would like support or simply to join in the fun of exploring what you want to express through you, join Barb Patterson and I in The Engaged Space that starts next Monday October 2nd. It is a 30-day experiment with experiencing the pleasure of engagement. The focus is the joy of being filled up with your true nature and expressing that in whatever ways make sense to you. Whether you participate or not, give yourself the gift of coming alive with who you are through the generosity of sharing yourself. As Howard Thurman said, “Don’t ask what the world needs. Ask what makes you come alive, and go do it. Because what the world needs is people who have come alive.” Go be your brilliant, amazing self, with no thought for how you look or how well you are doing. None of that matters when you come alive to who you are, and the impact of that is a gift beyond measurement.